Today, much of the buzz is around scale-out architectures, which have been made popular by companies like Facebook and Google, because this architecture is commonly viewed as more cost-effective and “infinitely” scalable. But, given the rapid pace of server design innovation, earlier concerns about scale-up servers no longer hold water. Newer scalable system designs blend features from both scale-up and scale-out approaches blurring the distinction between the two. Today’s modern scale-up architectures bring scalability, capacity and reliability together with the economics of the scale-out model. 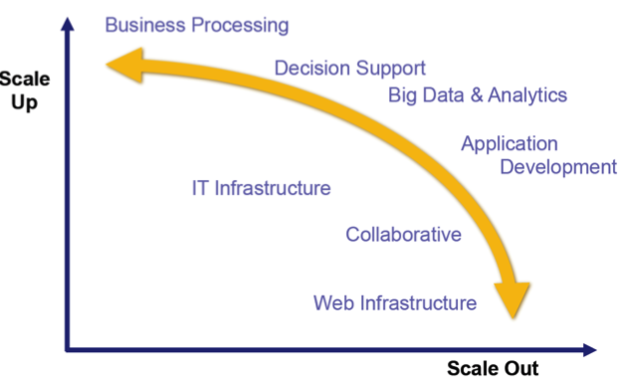 The scale-up model should now be considered for emerging applications like Big Data and Deep Analytics, especially given its inherent advantages such as globally addressable flat memory space for In-Memory Computing, scalability with low overhead, and easier management. Myth #1: Scale-up is prohibitively expensive. The higher cost of larger systems used to be a valid argument because things like special memory, I/O and other components -- while offering key benefits and higher value to the customer -- drove up the cost. Not anymore. Today, modern scale-up systems are designed to use low cost, commodity components as much as possible, debunking the “too expensive” argument. Plus, fewer larger systems lessen the overhead and are easier to manage than hundreds or even thousands of smaller servers. This is a big win for scale-up systems, since IT departments are looking at overall operating expenses, not just initial acquisition costs. Newer scale-up servers build high reliability into every level of the architecture, from processor to component to complete system, for continuous business operations. These systems constantly monitor themselves and can even take proactive measures to ensure uninterrupted operation such as dynamically degrading, off-lining, or replacing failed or failing components on-the-fly. Many of these newer servers also employ physical as well as software-based “partitioning” which provides levels of isolation to improve availability. Myth #3: Scale-up offers limited scalability. The notion that a single scale-up system is limited to the resources within its physical “box” reflects conventional thinking. The capacity of these systems has grown tremendously over the years. Today’s servers can offer up to hundreds of times higher compute density than previous generations, as well as much more memory and I/O capacity – all “shrunk” into a highly scalable, compact (as small as 1U) footprint that consumes significantly less energy. Innovations in system interconnect technologies have broken architectural limitations, enabling flexible growth across physical system boundaries with modular “building blocks.” Combining the best of both worlds, dynamic scalability is a powerful feature that merges the large transaction and analytics processing power of scale-up servers with the capacity growth and economic benefits of scale-out servers. Dynamic scaling is a way of bridging to the new world of cloud computing while protecting investments in existing applications. It’s worth noting that there are additional, unique advantages that scale-up architectures offer. One big advantage is large memory and compute capacity which makes In-Memory Computing possible. This means that large databases can now reside entirely in memory, boosting the analytics performance, as well as speeding up transaction processing. By virtually eliminating disk accesses, database query times can be shortened by many orders of magnitude, leading to real-time analytics for greater business productivity, converting wait time to work time. Is it feasible and economical to support both scale-out and scale-up workloads on the same system or class of systems? At the end of the day, it’s a question of how many nodes (scale-out) and the size of each node (scale-up).